Pulmonary hypertension (PH) is a type of high blood pressure that affects the arteries in the lungs and the right side of your heart. The condition begins when tiny blood vessels in your lungs, called pulmonary arteries, and capillaries become narrowed, blocked or destroyed. These smaller arterial blood vessels may be abnormally thick, scarred, inflamed, constricted or have clots. As the pressure builds, your heart's lower right chamber (right ventricle) must work harder to pump blood through your lungs, eventually causing your heart muscle to weaken and perhaps eventually fail. Normally, the lung vasculature can easily adapt to exercise-induced marked increases in blood flow. However in pulmonary hypertension, the vascular resistance and the pressure in the lungs is further elevated with activity and leads to decreased flow to the left side of the heart (which pumps to the rest of the body). Pulmonary hypertension should not be confused with hypertension — sometimes called systemic hypertension or high blood pressure. PH can occur in patients with or without this more common condition. The signs and symptoms of pulmonary hypertension in its early stages may not be noticeable for months or even years. As the disease progresses, however, symptoms worsen. 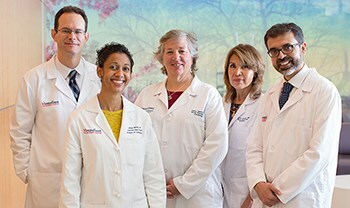 If you or a loved one suffers from pulmonary hypertension, our team of dedicated specialists at the Montefiore Einstein Pulmonary Hypertension Program is committed to diagnosing and treating this serious and complicated condition with expertise, diligence and compassion. Please review our site to learn more about our Services and Treatments and our Pulmonary Hypertension Team.